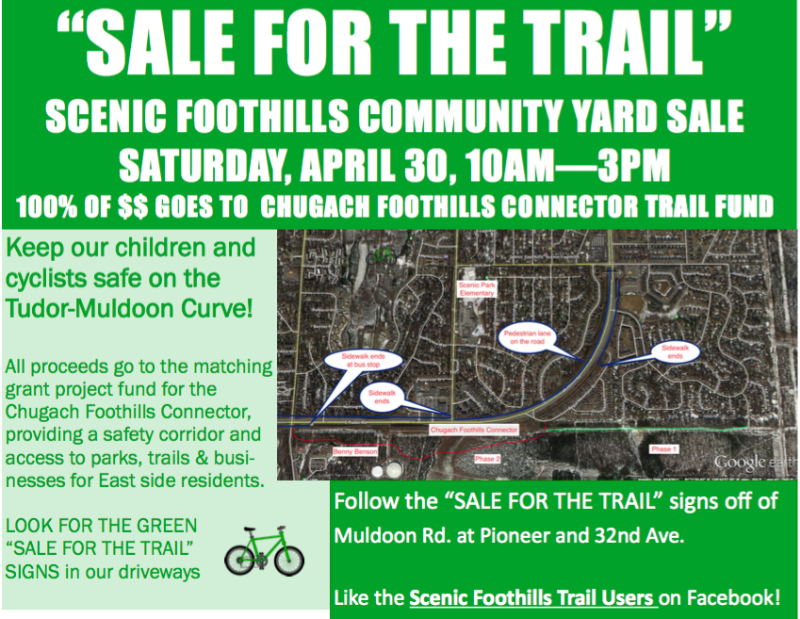 Scenic Foothills Trail Users are looking for donations of household goods in clean, working order. Donations can be brought to 8521 Little Dipper Avenue or 3220 Evergreen Street or 3220 Shamrock Street Saturday, April 23, from 10 am to 1 pm. The sale will be Saturday, April 30, from 10 am. to 3 pm. All proceeds go to the matching grant to fund Chugach Foothills Connector Phase 1. The map shows where the trail work will be this summer (in green). In red is the proposed phase 2 that UAA engineering students are designing. This entry was posted in Event and tagged 2016, april. Bookmark the permalink.